John Carroll is a member of the Alabama High School Athletic Association. The regulations and eligibility requirements of the John Carroll Athletic Department conform to those of the Alabama High School Athletic Association. The purpose of the Athletic Department is to encourage as many students as possible to participate in one or more of the athletic sports offered by the school to advance their physical and personal development. John Carroll participates in the following sports for boys: baseball, basketball, bowling, cross country, football, golf, soccer, swimming, tennis, and track and field. 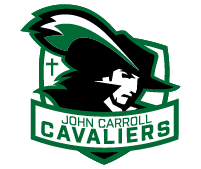 John Carroll participates in the following sports for girls: basketball, bowling, cheerleading, cross country, dance, soccer, softball, swimming, tennis, track and field, and volleyball. Students entering the 10th and 11th and 12th grades must have passed during the last two semesters in attendance and summer school, if applicable, at least six new Carnegie units with a minimum composite numerical average of 70 in those six units. Students must be enrolled within the first twenty (20) days of any semester in which he/she participates. Any student who becomes nineteen (19) prior to August 1 is ineligible to participate in interscholastic athletics during the entire school year. A student may compete inter-scholastically eight (8) consecutive semesters only, from the date he/she begins the first semester of the first year of any secondary school, or the first semester of the ninth grade of any junior high school. Ninth grade students are immediately eligible to compete in interscholastic athletics if they attended a Catholic feeder school in their eighth grade year; Other students must attend John Carroll for one year before becoming eligible. Before a student of John Carroll will be permitted to participate or practice for any sport, the following forms must be completed and submitted: AHSAA Physical form, NFHS Sportsmanship form), Student Release form, Parent Permission form, Concussion form, AHSAA Code of Conduct form and Birth Certificate.. Except in the case of an educational absence, a student may not participate in athletic activities (including practices/workouts) on the day of his absence without the permission of the Assistant Principal. To be considered present, a student must attend at least four (4) academic classes. Any athlete who receives two (2) or more “F” progress reports will be required to attend academic tutoring, coordinated by the coach from 7:00 a.m. until 7:40 a.m. Monday thru Friday until the end of the quarter. During this time, the athlete may participate in all practices and athletic contests. Based on the first and third quarter grades and the first semester grades, any in-season athlete who has two (2) or more “F’s” may not participate in athletic contests and must attend the daily required academic tutoring sessions for the next 4 ½ weeks (until the next progress report period). An ineligible athlete may only attend a practice if he/she has attended tutoring that same morning. Missing a tutoring session results in also missing the practice that afternoon. In addition, at the start of an athlete’s season (1st playing date), any player whose most recent report card has two (2) or more “F’s” may not participate in athletic contests and must attend the daily required academic tutoring sessions until the next progress report period. An athlete may become eligible to participate in athletic contests only after the athlete has no more than one (1) “F” on a subsequent progress report or report card. If the athlete continues to have two (2) or more “F’s”, he/she will continue to be ineligible to compete and is required to continue attending the academic tutoring sessions. August eligibility is based upon Alabama High School Athletic Association rules for eligibility, which are based upon semester grades, not fourth quarter grades. Athletes unable to honor their commitments to their chosen sports (including dance team and cheerleading) for any reason (grades, disenchantment, peer pressure, etc.) will be ineligible to participate in any other sport during that season. They are also ineligible to participate in any sports-related activities (conditioning, weight-lifting, etc.) or any other sports tryout not in season until the sports season ends in which the athlete chose not to honor his/her commitment. The season ends after the last scheduled contest has been played. It does not include any post-season play. For teams that have tryouts, commitment will be constituted after the last team cuts have been made and a final team roster has been posted. Athletes who are uncertain about making a commitment to a sports program are encouraged to discuss the program with the Athletic Director before they make a commitment. A student may not participate in two sports during the same season unless special permission has been granted by the Athletic Director.